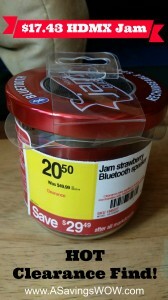 $17.43 HDMX Jam Bluetooth Speaker | A Savings WOW! How about you? What are some deals you’ve found on clearance lately? If you head out to Staples, don’t forget to check out the other back-to-school deals going on at Staples this week here.